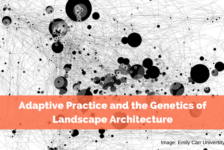 Article by Paula Uzarek. 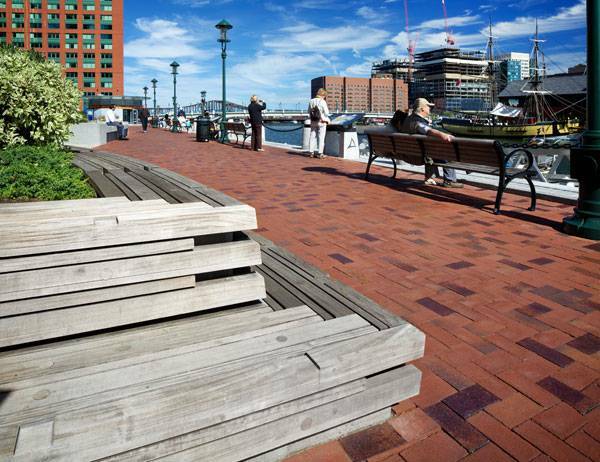 Atlantic Wharf Park, by Halvorson Design Partnership, Boston, Massachusetts. 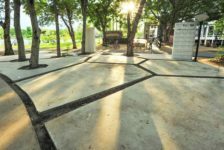 Designing a space in a district with historic roots can give a landscape architect a series of sleepless nights. How does one create a fresh, new space while protecting and preserving the past? 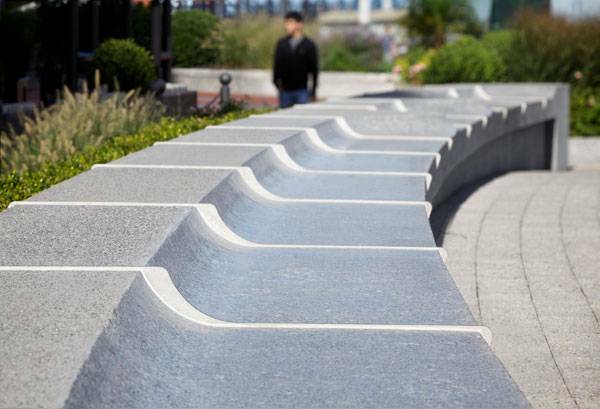 Should the designer take the risk and move beyond scheme, or just create a safe project? Can these two ways of thinking be combined? 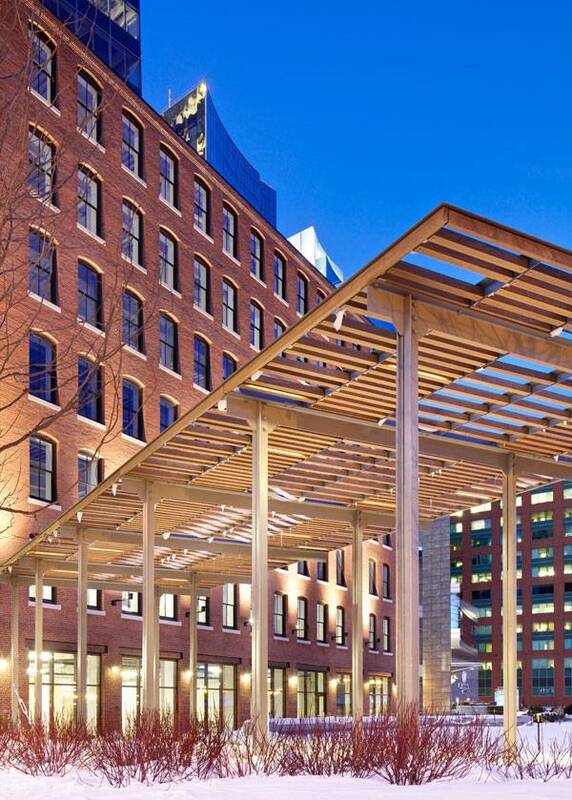 Atlantic Wharf in Boston, designed by Halvorson Design Partnership, takes a fresh look at a historic site and presents a solution that both preserves and improves the space. 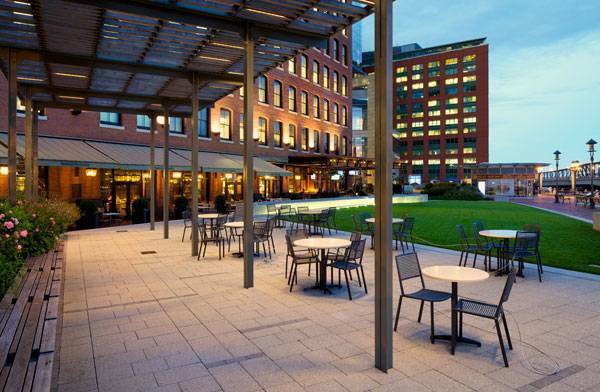 Connection is Vital Located in a lively Boston district, Atlantic Wharf faces the Fort Point Channel, named after a fort that dates back to America’s colonial epoch. The channel is surrounded by busy banks full of historical buildings, and sits less than half a mile from South Station, where buses, the subway and trains are only a few of the transportation options. Water taxi is also an option here. The public transportation reduces pollution through less car use, and encourages pedestrians to explore the area. 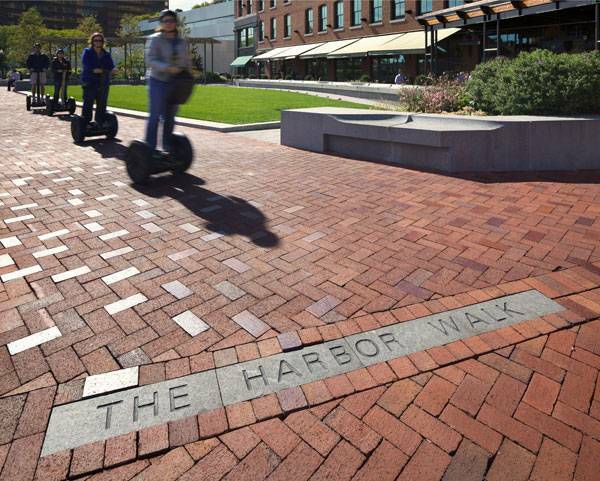 The Harborwalk connects the wharf with other public spaces within the harbor and provides an outstanding walking route. The Sustainable Union of the Old and the New The restoration of two historic buildings for Boston Properties was not the whole idea; that would have been too elementary. 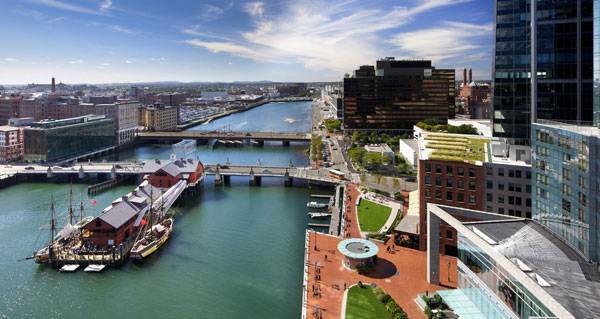 The waterfront was said to be resolved by drawing Boston’s life to the Harborwalk. The harmony of the design was also a major factor here. 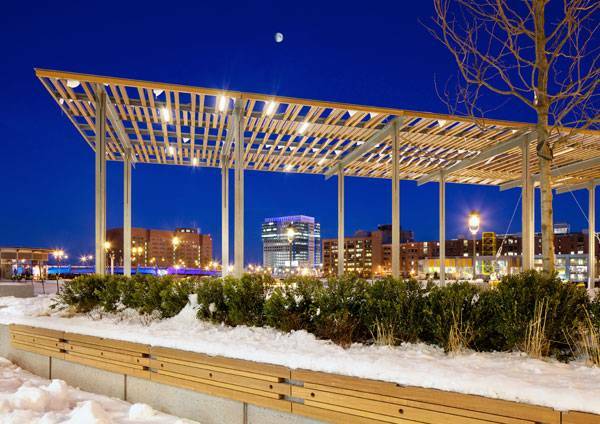 Halvorson Design was responsible for the Harborwalk, plaza, and extensive green roof design. 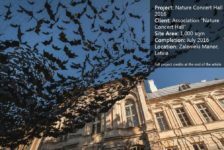 With the historical location, the project ensures that public spaces add value to the area’s dynamism. 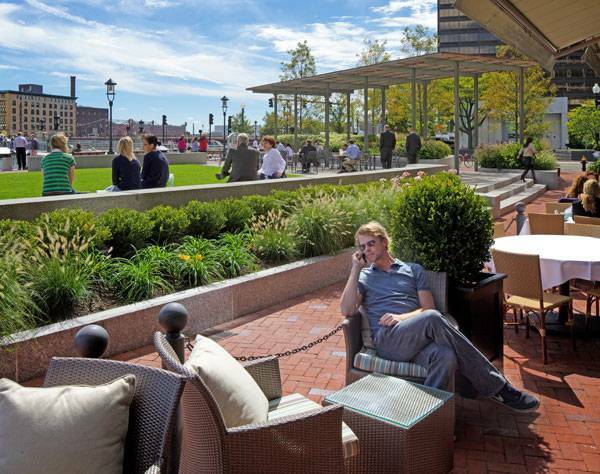 The property also joins the waterfront with the Financial District. Historic facades with modern elements refresh the place. The modern, mixed-use building designed by CBT Architects has two parts: a 31-story glass tower and a lower waterfront building. The historic facades were fully restored and consolidated with the new design, with the use of materials from recycling. 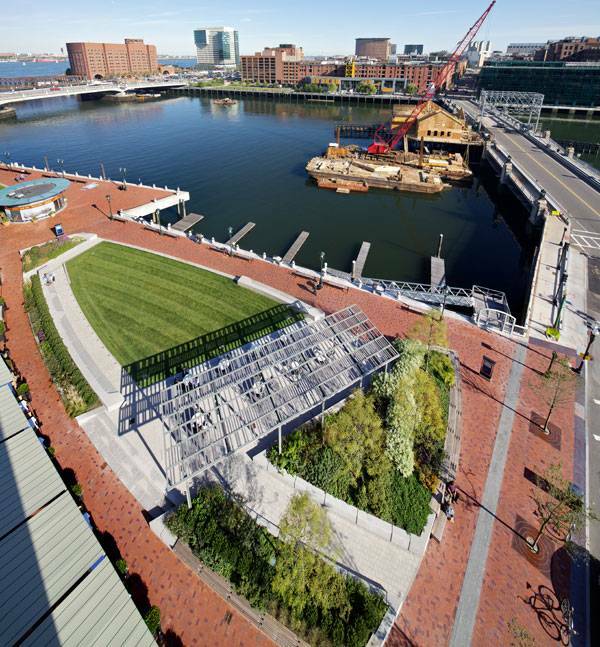 The Atlantic Wharf design includes about 42 percent of previously existing historical structures, which were restored and integrated. 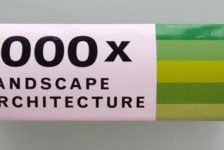 This allowed the designers to reduce the impact on both the environment and the historical site. Next, energy-saving solutions were added to minimize the use of artificial lighting and heating. Making it All-Attractive Through Elegant Detailing A large public plaza allows for many activities and public performances. The whole scene is soothing. Carefully chosen, both the frame and details of the space delineate the landscape. Shaped like a sailboat, the area reminds us of the Atlantic Wharf logo. The plane lawn seems to be the characteristic letter “A”. The planted trees, bushes, and other elements rise to the bottom of the “A”,dividing from the lawn through the use of a crossbar of wooden pergola. 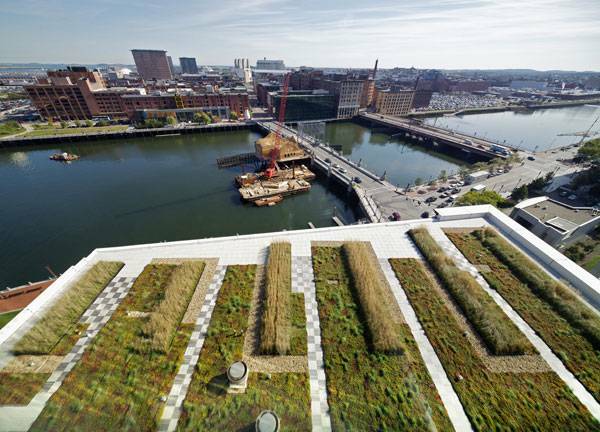 Increasing Green Spaces with the Extensive Green Roof The green roof covers the eighth floor of the Graphic Arts & Tufts Building, one of the three low-rise mercantile buildings in the area, which was known as Russia Wharf before the restoration. The extensive green carpet is a forepart for a harbor view. 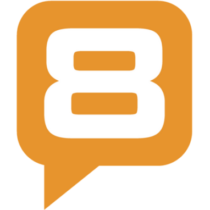 It is almost 18,000 square feet and is used to minimize the heat escape in the energy-efficient building. 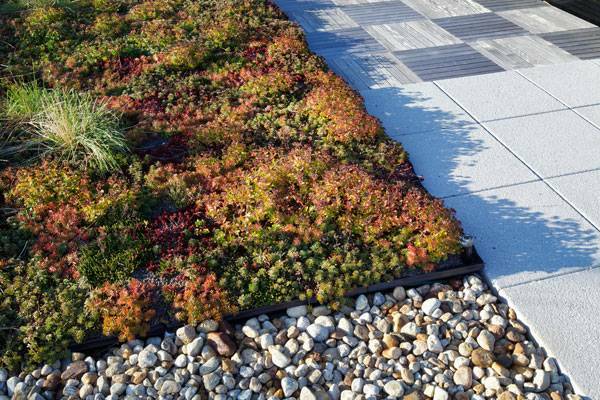 In addition, plantings on the roof reduce storm water run-off. Water Retention System The water retention system is one of the factors reducing the costs of irrigation, due to rainwater use and the planting selection. 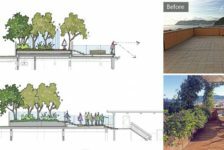 The result is natural resources preservation through the water efficiency of the building and the vegetated green roof combined. 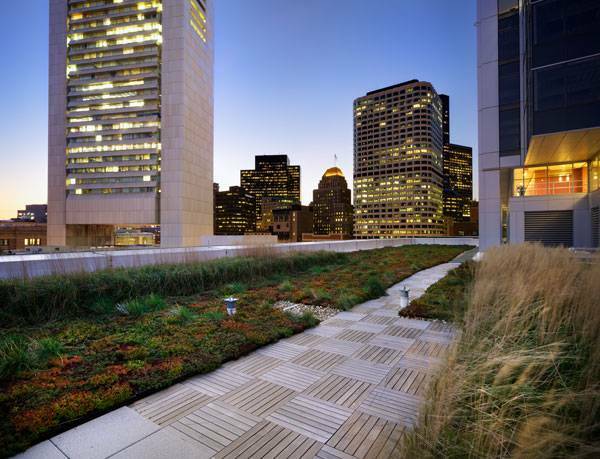 The Green Roof System The roof is a composition of modules that are pre-planted grids. The modules on the roof membrane are easy to access and therefore repair. 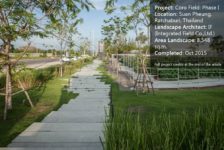 The pattern is neat, minimalistic stripes of verdant grasses and herbaceous perennials along a checkered wooden boardwalk. 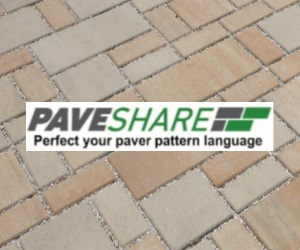 The hardscape areas and paths are made of crushed stones. 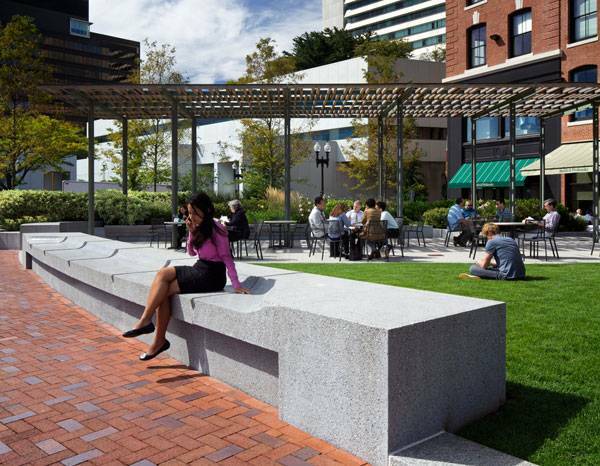 The plantings show diversity of color and size, including native vegetation that easily adapts to Boston’s climate.